The SQL Server data source selects data from a database in an SQL server. A standard connection string used to identify the SQL server, the database and authentication. Databases in an SQL server can contain multiple tables. You can access these tables directly by selecting Select a table as the query method, and selecting the table from the drop down list. For each selected table you must specify the name of the table and the ID column. The ID column is used to match rows in all tables. 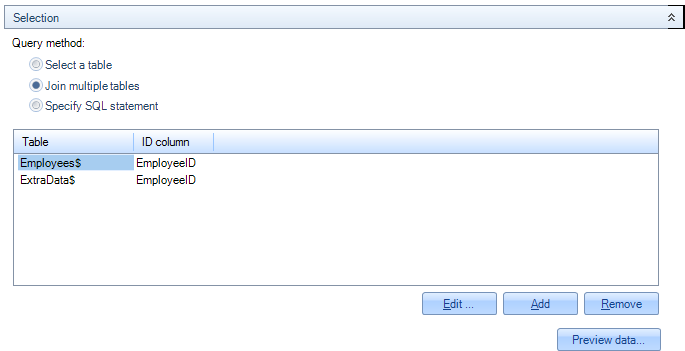 If you select Specify SQL statement as the query method you can specify custom queries. See SQL Quick Reference for a quick SQL reference and links to resources.